18ct Rose Gold Franck Muller Conquistador Cortez Chrono 10000 H CC. Case diameter 44mm x 44mm. Automatic FM 700 caliber, 42 hour power reserve, 25 jewels, platinum rotor.Black guilloche dial with silver sub dials, luminous numeral hour markers, rose gold luminous leaf style hands, date display at the 6 position. Brown croc strap. Box and papers dated June 2007. SKU: 3025088. 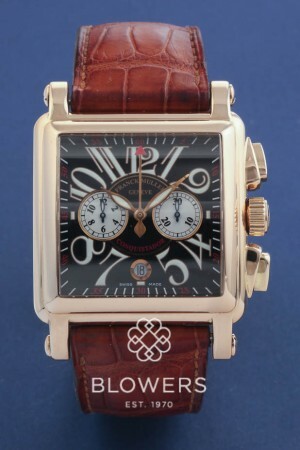 Categories: Conquistador, Franck Muller.